Still Water blog · Is reinterpretation the new emulation? Reinterpreting an ephemeral or obsolete artwork means remaking it from the ground up, sacrificing fidelity to the original material in favor of fidelity to the original spirit–or, at times, to the aesthetic possibilities of a new artwork. Despite the skepticism and anxiety expressed by some in the library and archive communities, reinterpretation may just be the instrument behind the next big wave of cultural stewardship, as emulation has been in the last decade. Reinterpretation has a great potential not only to activate collections and archives but also to unfold creative and curatorial processes. Moreover, through the act of reinterpreting, new audiences could use the art institutions and the museum as a platform of debate and discussion. Here, the capacity of reinterpretation to rethink, rearticulate and recontextualize artistic thought would allow for the exploration of the past from the present that equally questions our contemporaneity and devises other possible futures. 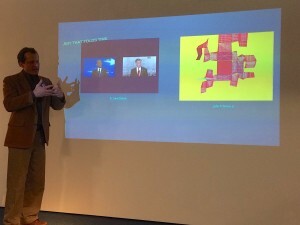 Examples presented in the Dutch conferences included Joost Rekveld‘s reconstructions of analog video hardware and performances by pioneering video artists Steina and Woody Vasulka, Seppo Gründler‘s miniature versions of famous artworks, and Florian Kramer’s only partly tongue-in-cheek recommendation that films be saved for posterity as paper flipbooks. The assembled experts came from the worlds of theater, music, and other performance genres, breathing new perspectives into the sometimes inbred world of digital preservation. 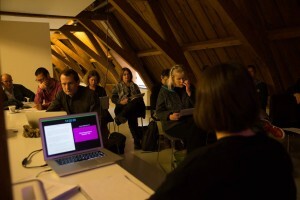 Composer Elisabeth Schimana argued that musical scores are an extension of oral culture and challenged the audience to consider how analogous software is to a score (as proposed by Re-collection co-author Richard Rinehart. Dramaturge Fransien Van Der Putt, meanwhile, explained how reinterpretation is the natural default for theater, where nothing besides the script–no clothing, furniture, and certainly none of the actors–is kept from one staging to another. 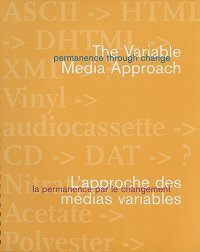 The three other strategies described in Permanence Through Change have by now become familiar to anyone working in variable media preservation. Storage is the default preservation strategy that comes to mind to most lay practitioners, and some professionals as well. But storing a digital file on a magnetic tape or disk drive does nothing to prevent the eventual obsolescence of its software and hardware, from video codecs and web formats to floppy disks, CDs, and USB drives. Migration is another strategy that can be used to preserve documents and files by moving them from one format to another. While a common standard in analog audio and video preservation, migration can be less effective for digital files, which often depend on layers of software and hardware context that are difficult to update along with the audio or video itself. Indeed, from the initial question (Can reinterpretation as a creative act be seen as preservation strategy?) we have perhaps arrived to its inversion, can preservation be understood as a creative act and therefore include reinterpretation as one of its strategies? Now that emulation has found acceptance among mainstream preservationists, reinterpretation may be the new kid on the block.